Q. How do I create a histogram in Excel (Windows based version)? 1). Highlight the cells with numerical data that you want to be included in the chart and go to Insert > Recommended Charts. 2). Select All Charts > Histogram > OK.
3). Now you have your Histogram Chart. For a visual of these steps to create a Histogram in Excel, see below. 1. Highlight the cells with numerical data that you want to be included in the chart and go to Insert > Recommended Charts. 2. Select All Charts > Histogram > OK.
3. 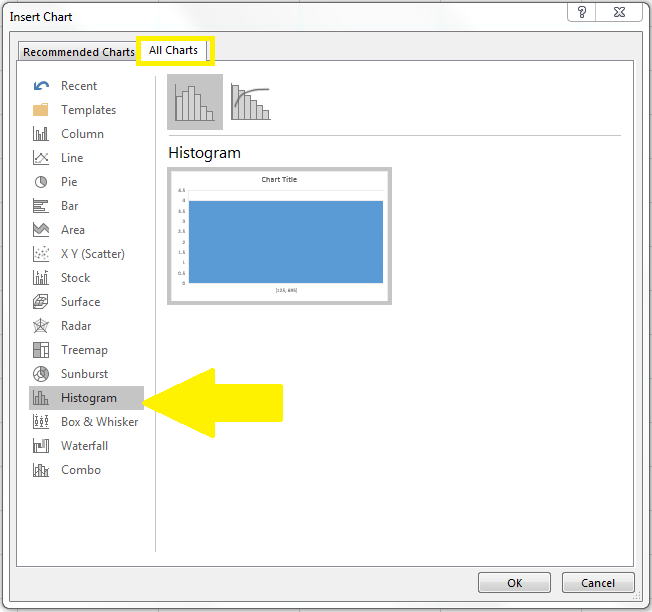 Your histogram chart will appear directly on your Excel spreadsheet. Use the and buttons to edit chart elements and design.